Will a redress scheme adequately compensate victims of sexual abuse? Please note – this article has been updated in 2018. Advocacy groups have been funded for years to campaign for compensation for people who have been abused as children by clergy, teachers, foster carers, house parents, home superintendents and other institutional workers. They latched onto the Royal Commission’s recommendations a year ago with great hope and pushed hard for the Prime Minister to make it all happen. 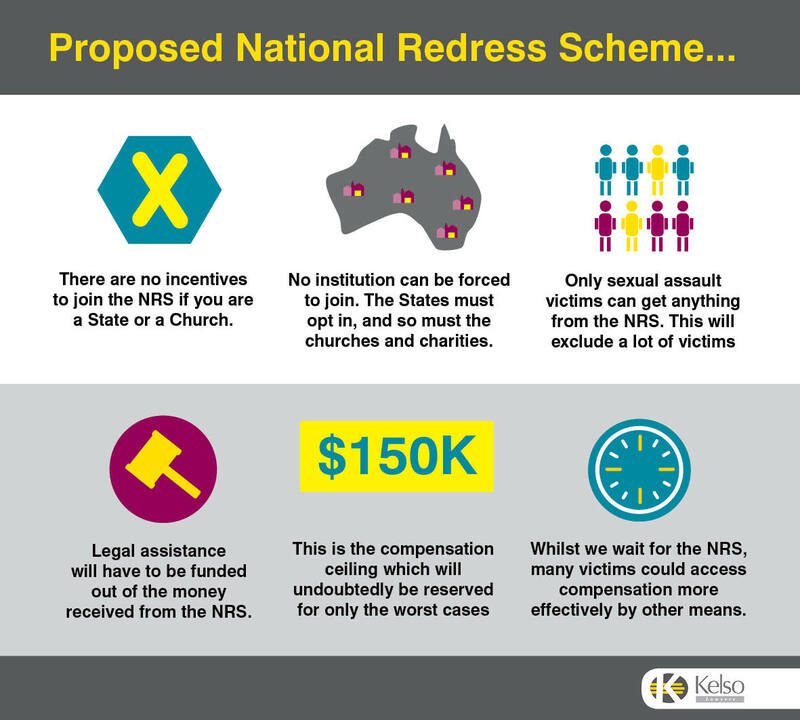 The Government has since announced and (poorly) implemented a $150,000 capped National Redress Scheme (NRS). There are, however, some fundamental differences between the Government’s NRS and what was initially recommended by Chairperson Justice Peter McClellan. The following analysis outlines some of the key points of the NRS and the likely effect on key stakeholders. No institution can be forced to join. The States must opt in, and so must the churches and charities. And there are lots of churches. A failure to opt in will result in an ineffective scheme, and the results will show. It is disappointing to imagine what the NRS with only a couple of States and a handful of churches becoming involved. A compulsory scheme, on the other hand, has the potential to generate some real results. The States and institutions who have signed up only seek to benefit themselves, as more people will sign up to the NRS than look at their other options. The payout through the NRS is much lower than if you looked at filing a private claim. There are no incentives to join the NRS if you are a State or a Church. The Salvos in Australia are divided into two separate legal entities, each run by its own leaders and each reports to International Headquarters. The biggest group is the Eastern Territory. It has its own scheme with a cap of $150,000. It is run by the Eastern Territory Salvation Army, who decide how victims are compensated. It’s difficult not to be critical of a scheme that is run by the organisation themselves, where the financial viability of the Eastern Territory Salvation Army is directly related to the amount of compensation paid out. A scheme that is managed by a third party without any interest in the Salvation Army as an organisation. With a lack of incentivisation, why would any Australian State or Territory join a scheme that will cost money which they can’t be forced to spend? Only sexual assault victims can get anything from the NRS. This will exclude a lot of victims. Originally, it was recommended that victims of all kinds of child abuse be included, but sadly that was dismissed. This approach has the unfortunate outcome of creating a kind of classification system for victims of child abuse, which ultimately results in the “lucky ones” receiving compensation, and the rest. The $150 000 figure will undoubtedly be reserved for the worst cases and is the absolute maximum. It’s called ‘the cap’. You can’t get any more than that. It’s likely that this amount will only be offered to a few individuals who have suffered extreme abuse. All other cases will be graded downwards, with a minimum likely to be in the vicinity of $10,000 and an average might be something like $65,000. If a victim has already received compensation, they may be able to apply for a ‘top up’. But you won’t get any more money if what you have already received exceeds what the NRS assesses for you. Legal assistance will have to be funded out of the money received from the NRS. Alternatively, victims can use a free lawyer from a Community Legal Centre whose expertise likely lies outside of child abuse compensation. The fact is that specialist, private lawyers will have the most experience with compensation work. The best thing to do right now is to use a specialist private lawyer to take on the States and the churches direct. Delaying compensation cases could end up being detrimental to your search for justice. In some cases, by taking a claim directly to an institution, a victim may receive compensation far in excess of the $150,000 on offer by the NRS. Whilst we wait for the NRS to assess claims, many victims may be forced to wait for compensation that they could access more effectively by other means. The real tragedy is that in some cases, the quest for justice and compensation may not be completed until it’s too late. If you think you’re eligible for compensation, complete our claimant information form.